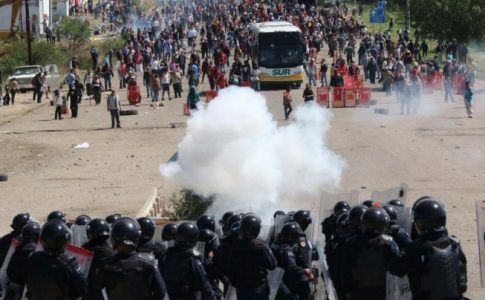 Stop the Government’s repression in Oaxaca! 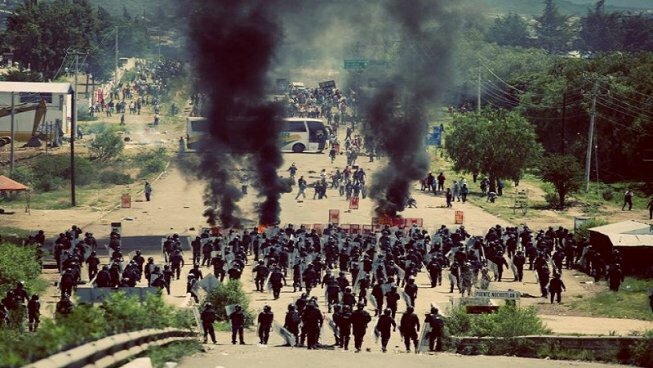 Day of fury in Oaxaca: The Mexican Federal government of President Peña Nieto and the Oaxacan Governor, Gabino Cué, have ordered a brutal repression throughout the state of Oaxaca. So far there have been six confirmed deaths. In Salina Cruz, Nochixtlán and Oaxaca de Juárez, the fury of President Peña Nieto and the Secretary of Education, Aurelio Nuño, was unleashed on the teachers of the State Teachers’ Union Section 22 and on working class sectors who are fighting alongside the teachers. With the use of bullets and gas, the government is trying to stop the struggle against the education reform. So far the repression has left 6 dead and many more injured and detained. Among the arrested is Juan José Ortega Madrigal, leader of the National Teachers’ Union (CNTE) Section 18 as well as leaders of Section 22, like Ruben Núñez and Francisco Villalobos. Through the use of brutal oppression, the government aims to give the teachers a lesson, hitting the most combative sectors the hardest — the same sectors of the union that lead the heroic teachers struggle and the Oaxaca Commune in 2006. They also want to intimidate the Mexican workers and people in order to discourage the struggle against the reforms, including the education reform, that are ordered by Washington and carried out by Peña Nieto and the parties that made the Pact for Mexico. All of this is taking place just two days after a massive march in Mexico City, where the teachers confronted yet another repressor, Mancera, the current Mayor of Mexico City and a member of the PRD — among those that signed Peña Nieto’s (PRI) Pact for Mexico. 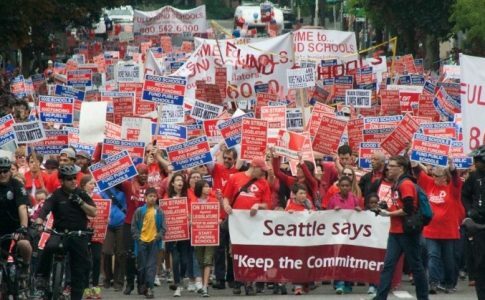 More than 14,000 people marched in the streets, showing the overwhelming support for the teachers’ struggle. Present at the march were parents of the disappeared students of Ayotzinapa and workers from various sectors. 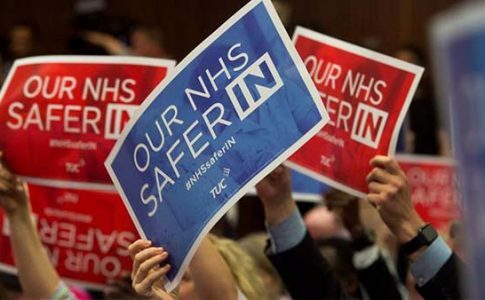 Meanwhile, solidarity and support has extended across the country and internationally. After the elections of June 5, which were disastrous for the PRI, the attacks on the teachers, in the form of the education reform, have become worse by the week. It’s a priority of Peña Nieto, who is at his lowest point in popularity since the beginning of his term, to put an end to the protests at any cost in order to maintain the state of “social harmony” that the imperialist and investing nations are demanding. It’s not a coincidence that the Mexican president has announced his plan of development in the so-called Special Economic Areas, the same states that register the greatest number of protests: Oaxaca, Chiapas, Veracruz, Michoacán y Guerrero. These are the regions with the greatest displays of teacher dissident. For Peña Nieto and Nuño, employees of big international business, it is of the utmost importance to break up the unity between the teachers and the workers, which continues to develop with each passing day. In response to the brutal attack against the working people, the teachers must be surrounded with active solidarity. We need to push for a massive, united democratic movement in the streets to show support and solidarity with the teachers who are being repressed in Oaxaca and to put a stop to the repression. Political organizations, unions, intellectuals, public figures, and social organizations, like human rights organizations, must call for a mass mobilization. We need to see hundreds of thousands, even millions in the streets, to demand that the government stop the repression of the teachers! Charge those responsible for the repression that caused the death of our comrades! All support for the CNTE’s (National Teachers Union) demands! The call made by López Obrador for a display of solidarity on Sunday, June 26 is too late of a response to such brutal repression. 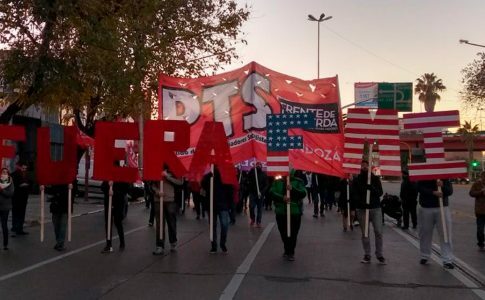 We’re making a special call to those Morena supporters who are for the defense of democratic rights, to demand that the leaders of their party put all of their resources and energy at the service of the teachers and call for participation in the mobilizations, occupations, and in whatever way that the teachers decide they need support. We can’t wait until Sunday, June 26. The teachers need our support and solidarity now. To the thousands of youth and workers who support López Obrador and who honestly support the teachers, we propose that you demand that the call to support the teachers not be utilized as a means of strengthening Obrador’s position in the elections but instead to support the massive national struggle against the education reform and state repression. The current task is to put forward a massive democratic movement of millions of workers, youth, and working class fighters against the repressive government and its institutions. At the same time, we’re making an urgent call for an international solidarity campaign with actions at Mexican embassies and consulates around the world, along with declarations of support. Several teachers’ organizations from various countries have already started to show their support, as reported in Izquierda Diario. It’s especially important that the workers take immediate action to twist Peña Nieto and Nuño’s arms and to surround the Oaxacan teachers and the working class in the streets with solidarity, from workers of the labor unions that call themselves democratic, like the UNT (National Union of Workers) to the workers organized under government-led unions. The workers have already taken steps in that direction: on June 14, hundreds of thousands of workers, including telephone operators, university students, health workers, electricians, transport workers, and others, took to the streets in solidarity with the teachers. Another march was organized on June 17. Other examples of support include health professionals providing their services to teachers in the struggle, the support of the miners from section 271, or the support of the oil refinery workers en Salina Cruz, who brought fresh drinking water to the teachers and those in the struggle. But this is not enough. We in the MTS (Socialist Workers’ Movement) believe that there must be a call for a national strike to condemn the brutal repression of the teachers. The strike must include all of the workers. Not a finger should be lifted in workplaces across the entire country in order show our rejection of the disastrous education labor reform. The only real intentions of the reform are to deteriorate the teachers’ working conditions, to later attack the conditions of the working class as a whole. We must call for a strike in defense of the CNTE because with every political prisoner, with every accusation against the combative teacher’s union, they are working towards breaking up unions. Those on top are afraid of the organization of the working class, which is why they’re campaigning to destroy the unions. In light of this attack, the unions that are independent of the government, like the UNT and CNTE, must set a date for a nationwide strike. They need to call on the millions of workers that are under the government-controlled unions, that are suffering from low wages and poor working conditions in the factories, to join in a day of protest and solidarity. A National Conference of unions and fighting organizations, needs to be called by the CNTE immediately, to coordinate and organize a plan of action together with the teachers’ movement — because an injury to one is an injury to all! We are especially making a call to the 11,000 people that voted for Sergio Moissen and Sulem Estrada, teachers running on an anti-capitalist platform in the most recent elections in Mexico City, and also the people who voted for the Morena Party in order to punish the PRD, the governing party in Mexico City, to support the sit-ins in the capital city and the teachers movement. If the movement is able to defeat Pena Nieto, Aurelio Nuno and international groups pushing for the reforms, the teachers movement will come out victorious, and it will be a great triumph for the entire working class, the youth and poor sectors of the country. A victory would put us in a condition to take on the other proposed reforms. Free all political prisoners! Stop Pena Nieto and Gabino Cue’s repression! All support to the heroic teachers’ movement and the people of Oaxaca! Down with the education reform!